As we worked on C.elegans in the context of the Stargate WCC project, we wanted to focus on it as a safe and very relevant model organism. C.elegans is subject to many researches and great discoveries. This model organism was first developed by Sydney Brenner 50 years ago as a genetic model for understanding questions of developmental biology and neurobiology. Currently, diverse areas modern biology including studies of the basic functions and interactions of eukaryotic cells, host-parasite interactions, and evolution use the model C.elegans. It is also a relevant model to study processes in many human diseases. As we studied unc-60, a gene involved in the muscular development in C.elegans, it was very important to see if the phenomenon observed in worms could have perspectives in medical research linked to muscular deficiency for exemple. Why is C.elegans such an outstanding experimental model ? I. What should we know about C.elegans ? C.elegans has many advantages as its small size, rapid life cycle, transparency, and well-annotated genome. These properties allow scientists to work on biological problems on a genetic point of view, using forward and reverse genetics, from a single cell of the worm to its whole organism. However C.elegans is not only useful in research laboratories, it is also a great organism to show at school life in cells and tissues. Sydney Brenner brought this organism in the lab in 1974. He decided to study it because of the ease of genetic manipulation. What are the properties that allow easy genetic manipulations? Is there any limit to these properties ? Among the C.elegans, we can find hermaphrodites and males. Hermaphrodites allow self-fertilization. This way, when an hermaphrodite worm is mutagenized, the mutation can be maintained through self propagation in following progenies without mating with males. C.elegans takes around 3 days at 25° to develop from fertilized aggs to adult worms that can produce their own fertilized eggs. We can preserve C.elegans mutant strains. It helps study of cells and developmental biology. Scientists can make analysis at the level of a single cell within the context of the whole living organism. It also enables studies in living organisms requiring fluorescent protein reporters. Thanks to transparency, optogenetic tools can also be effective in C.elegans, with many applications in the nervous system. Although many genes in C.elegans can be found in other metozoans, some metazoan’s regulatory cascades cannot be find in this worm. There is no C.elegans cell culture lines. The small size of the worm makes experimental manipulations in individual tissues very difficult. 1. What are the main features of this community? The C.elegans community has been characterised by a unique sharing spirit since the introduction of C.elegans in research labs. This openness of the community was first initiated by the publication of the C.elegans biannual newsletter for the interchange of ideas and information: The Worm Bredder’s Gazette. This gazette aims to publish brief articles about new findings about C.elegans and other nematodes, meetings and experimental techniques. It is entirely published online. This large community supplies few databases about nematodes. An important on-line resource that provides information including gene expression, gene function and references is Wormbase. WormBase is an international consortium of biologists and computer scientists dedicated to providing the research community with accurate, current, accessible information concerning the genetics, genomics and biology of C. elegans and related nematodes.” (from Mission Statement of Wormbase). Wormatalas database features behavioural and structural anatomy of C.elegans. The CGC promotes significant research on the model Caenorhabditis elegans and other nematodes. It is the international centre for the acquisition, maintenance, and distribution of genetically and phenotypically characterized nematode stocks. Beside on-line interchange information and ideas, researchers from C.elegans community use to share their discoveries through important meetings. This year, the 21st International C.elegans Conference took place in Los Angeles in June. This event provides a forum that benefits both C.elegans veterans and newcomers. It gathers more than 1,500 participants. It was very enlightening to discover all these aspects during our project. The sharing spirit of the C.elegans community is very inspiring; it shows that if we share, we can do huge discoveries together. During the summer, we had the opportunity to meet one of the members of this community. It was a pleasure to talk to Professor Asako Sugimoto, from Tohoku University. Asako Sugimoto is currently a Professor in Life Sciences in Tohoku University in Sendai. 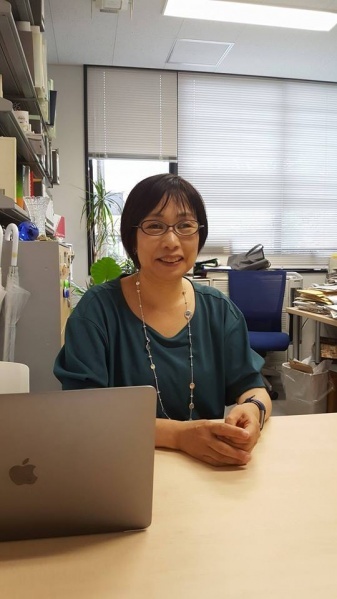 She is a member of several scientific societies and communities such as the Molecular Biology Society of Japan, the Japanese Society of Developmental Biologists, the Japan Society for Cell Biology and the Japanese C. elegans Community. Pr. Sugimoto used to work for the first time on C.elegans as a postdoctoral fellow in the department of Biochimistry, in the University of Wisconsin-Madison. She did not work on this model by any chance. Indeed, she chose to work on it when she scarcely finished her PhD about “Characterization of genes involved in the initiation of sexual reproduction process in fission yeast” in the University of Tokyo. In her lab, her team works on Caenorhabditis elegans as an experimental model. They aim to understand developmentally important mechanisms. To do so, her lab uses RNAi in a high-throughput system to interfere with gene functions. Through this experimental technique, they can identify individual genes and gene groups with important functions during the development and determine phenotypes resulting from their loss of function. Once these sets of genes are detected, they can proceed to live imaging and other studies. They currently focus on mitosis and meiosis in the context of development. Finally Pr. Sugimoto talked about studying other nematodes in order to compare similar phenomenon in different species. It was such a pleasure to meet Asako Sugimoto and to learn about other fields that we can study with C.elegans. This interview was very interesting and inspiring. Pr. Sugimoto’s career path is impressive and she seems passionate and invested in the C.elegans Community. In order to help igemers who wants to use C.elegans for their experimentations, we have created a guide that resume some informations about C.elegans, why it is a good model, and how to use it. Feel free to email us to provide some feedback on our project, have some information on the team and our work, or to just say hello !